Somethings in life are simple (not marriage or taxes) and when I feel nostalgic -or I just want something sweet!- then I resource to Memory land. When I was a kid, last Century (fact) then the woman who claimed to be my mother, who was a good cook (not as good as me...sorry mom! -mother issues?) used to make chocolate pudding and I just simply loved it. One would have imagined that that woman -let's call her my mother- cooked chocolate pudding from scratch... but NO!... she opened a little box (Royal?) and mixed it with milk... put it on the fridge and... blackmailed me with the mega used phrase "and imagine that I did all this just for you! and that is how you pay me". I ate feeling guilty. After conquering my guilt, I normally went back for a second one. I just loved it!. Many many years later I decided to cook it like my mom... and I went to the supermarket, bought a box of chocolate pudding, came home, made it and... just cruel disappointment!. It was absolutely horrible. I called the current wife and told her: "my beautiful rose bottom...come to the kitchen!.".. she came and, as a fact...slap me in the face and left. Got me thinking...what did I do wrong this time? Not "bottom" !! !...I meant "bud" !!!... I told her with tears in my eyes. She was listening... "hey, I just made this chocolate pudding for you". She liked the idea and slowly but surely ate them all (I didn't ate another one as I really heated it). That got me thinking: There must be another way. I went to an old cookbook and...voila!... 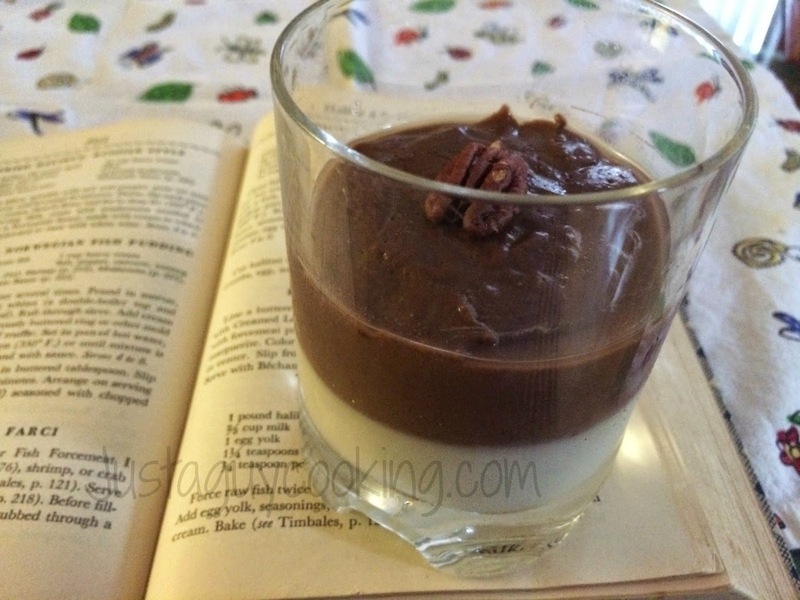 chocolate pudding from scratch. I just adjusted it a bit, removed the cocoa powder and did a vanilla one too. Mixed them. The mix was heavenly!... so I am sharing with you. I am a good guy!! By the way, when I told the current wife that I had made another batch... she looked me with pity and didn't ate or tasted it... she hated the first one I did. It worked!!! All the chocolate vanilla pudding was for me !!! Try it at home... it works! 2. In another bowl we beat the egg and the 2/3 cup of milk and beat well (I use a large beater, works great). 4. Gradually we add in three stages the dry mix and we whisk until completely dissolved. If you have any lumps (the corn starch!) then just remove them with a colander. 5. Gradually we add the egg mixture over the hot milk whisking the whole time. When is fully incorporated, then we bring it to a boil and keep stirring like crazy!…the mixture will thicken (2 minutes or so). We remove from the heat immediately. 6. Finally, we add the vanilla extract and stir until incorporated. Reserve. 7. The chocolate mix: In the medium bowl where we mixed the dry ingredients, now we are going to do the exact same but we are going to add the sifted Dutch cocoa powder. 9. We pour the chocolate pudding into six glass serving dishes, and clean any spills you have on the glass walls. 10. Now we pour the vanilla pudding and we clean again any spills (so it looks neat! 12. When we are ready to serve, we add on top some fresh fruit (strawberries are a great choice!) or nuts or sifted cocoa powder or… nothing.